Although many of us have faced hard times, few of us reading this have faced poverty. Over 25 % of women heads of household live in poverty. That number is nearly double for Latinas. They work hard to put a roof over their children’s heads, food on the table and clothing on their backs. But for them, even one missed day of work due to medical challenges, their own or those of their family, can make the difference between remaining independent and going on welfare or to a woman’s shelter. This is where Bloom Again Foundation comes in. We provide a bridge to health to economically vulnerable working women when they encounter medical challenges through rapid response financial assistance for living essentials. The mission of Bloom Again Foundation is to provide rapid response financial assistance to economically vulnerable working women when they need it most due to personal or family medical emergencies. Millions of these women are one paycheck away from poverty. They scrape together what’s needed to get by from paycheck to paycheck without federal assistance, but one illness in the family, a car accident, or other medical emergency is life-changing for them. A gift from Bloom Again Foundation provides working women living at or near the poverty level with the security and peace of mind needed to recover from incapacitating illnesses or maintain their households during medical emergencies. Over 90% of your donation goes directly to women in financial need. Our vision is a world in which there is health equity in the healing process for all women. Bloom Again Foundation was founded by bestselling author, Dr. Lois Frankel, along with like-minded friends and colleagues committed to helping women in need. While Dr. Frankel was being treated for breast cancer she realized how fortunate she was to have all the resources needed to allow her to heal at her own pace. At the same time, she thought of the thousands of economically vulnerable women who were not as fortunate and vowed to help them once she was back on her feet. A friend’s observation that it looked as if she was “blooming again” when her hair and eyelashes began to grow back provided the name for the organization. Bloom Again Foundation has helped hundreds of working women to get back on their feet again. All are referred by nonprofit social service agencies, clinics or hospitals by people who are familiar with their situations. Here are just a few of the women generous donors like you have enabled us to help. Zoila works as a housekeeper. When her sister was in the hospital with terminal cancer she missed several days’ work to be at her sister’s side. Bloom Again supplemented her wages with $1,000 so that she could be with her sister when she died. Josefina was working as a home health aide when she hurt her back lifting a patient. As the sole provider for her elderly mother, she couldn’t pay for the rent while she was healing. Bloom Again paid $800 for two months rent and she is now back to work and supporting herself and her mother. Beatriz was working on a lunch truck earning minimum wage. In 2009 her husband lost his job, went to San Francisco seeking work and left her with their six children. He never returned and she got by supporting herself and her children until she slipped and fell at work. She wasn’t able to work for several weeks and, in the meantime, got behind in her rent. She was about to be evicted and placed in a shelter with her children when Bloom Again Foundation was contacted through her church. Through the generosity of Bloom Again donors, a gift of $1,730 enabled her to catch up on her back rent and pay for an additional month so she could get on her feet again. Grace was employed as an RN in a nursing home when she was diagnosed with Sigmoid Colon Cancer. Subsequently, she was diagnosed with metastatic cancer of the liver. She started oral chemotherapy on November 29th. Unfortunately, since being treated and trying to return to work, the nursing home was sold and the new owners do not provide health insurance for part-time employees. Grace could not pay for her rent or food when her social worker contacted Bloom Again and we provided her with $1,000 in food cards and $1,800 in rent so she could remain in her home until her disability insurance came through. 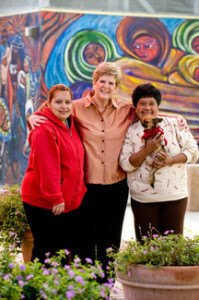 Maria has worked all her adult life as a private duty housekeeper, currently earning $1300/mo. In 2011 she suffered with abdominal pain and was experiencing difficulty eating and breathing. She was found to have a 15 pound tumor and was told that it was pressing on her organs, causing her symptoms. She had surgery in December, where professional charges were covered by a county program for the uninsured. However, labs and x-rays were not covered. As a result she now has over $600 in medical bills. Added to this burden is the fact that she had to take 2 months off of work to recuperate from an extensive surgery. She received assistance from a local charity to pay her rent the last two months but is still short one month. To help make life a little easier for her and enable her to heal, Bloom Again paid for two months’ rent. Kathy has prided herself on always being independent. She built a dog training and walking business that allowed her do what she most loved. But when she was diagnosed with Stage 3 ovarian cancer her life changed. Hospitalized for a hysterectomy, her $500 daily hospital co-payments quickly used up all of her savings. When she contacted Bloom Again she had just begun chemotherapy and was anxious to get back to work, but needed help with her upcoming rent payment. Bloom Again was happy to help with a $720 payment to her landlord and the promise of one more month if needed. Bela’s daughter underwent six surgeries for breast cancer. After her most recent surgery Maria had to stay home from work to care for her. As a result, she did not have the money to pay for her utility bill for three months. When Bloom Again was contacted by her pastor on a damp and rainy day a week before Christmas, the utility company was going to turn off the electricity and water in her apartment if the bill wasn’t paid by 5 p.m. The generosity of donors like you allowed us to pay the $313 bill and allow Maria’s service to continue uninterrupted. Natasha’s ex-husband shot her six times, leaving this single mother of a ten year old and four month old with a collapsed lung and bullets that cannot be extracted from her body for some time. A Russian immigrant with no family in the United States, she was working on state-funded projects striving for independence when she became the victim of this hideous crime. Her primary concern was care for her four month old during her period of recuperation. Bloom Again provided her with $800 in child care assistance. Tina was working as a sales clerk at a specialty kitchen shop when she learned she had a recurrence of breast cancer that required a double mastectomy. What was supposed to be just a few weeks off of work, turned into several months when the surgery caused a serious infection requiring yet another surgery. High insurance deductibles left her with over $15,000 in medical bills and on State disability with an income of only $1,200 monthly. Donations to Bloom Again enabled Tina to receive a gift of $900 to pay for her rent until she could get back on her feet. Rosie, the mother of four children (one a special needs child) and a domestic abuse survivor, was working as a seamstress in the textile industry in downtown Los Angeles when health issues forced her seek other employment. She then working as an assistant restaurant manager, earning minimum wage, when surgery for ovarian tumors caused her to have to leave that job. Although Bloom Again could not help to pay all of her outstanding bills, we were able to provide $1,480 to cover her rent and $210 for her utility bill until she got on her feet again. Elena works in construction and when leaving mass one Sunday morning another car hit hers, sending her to the hospital with a broken leg. Her car was impounded after the accident and since she couldn’t drive, there it remained there for several weeks. When she finally was able to return to work she needed $1,074.76 to get the car out of impound. Generous donations to Bloom Again enabled her to retrieve her car and start working again.